Coops and barns are never parasite free; they are the homes to mites, lice, and fleas. These parasites live in the cracks, crevices, and bedding where they come out at night to feed on the adult and baby birds. Flies and mosquitoes are a constant nuisance they carry deadly viruses that can affect the health of your flock. Ammonia NH3 is extremely harmful to the respiratory systems of birds. 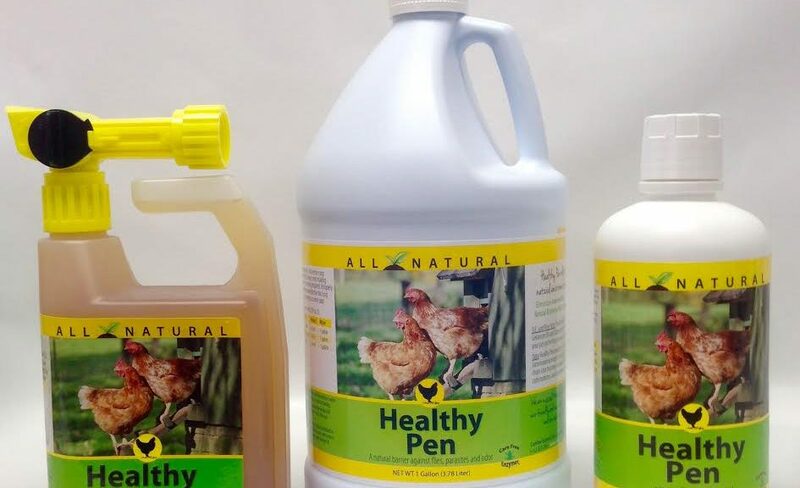 Healthy Pen eliminates all of these problems in one simple product, providing you with a much happier and healthier bird. Our blend of all natural enzymes in Healthy Pen attack the parasite at all stages of life; egg, pupa, larvae, and the adult killing the entire life. Diatomaceous Earth (DE) will place a barrier in and around your coop protecting your birds from creeping insects for long periods of time. DE is made up of tiny silica shells that will slice the outer layer of the parasite causing dehydration. A mixture of natural enzymes for parasite control with the addition of all natural oils that are known to repel flies, mosquitoes, and other flying pests. Healthy Pen’s Enzymes breaks the chain of NH3 (ammonia) and NH4 (ammonium acetate) to N (nitrogen). By breaking the carbon chain odor becomes neutralized. All ingredients meet EPA requirements as a minimum risk pesticide under the 25(b) FIFRA.